The horses listed are currently in quarantine or the rehabilitation process. We treat each horse independently based on their needs. Some horses need to put weight on, others need desensitization training, and some have substantial health concerns, but no matter what, our primary goal is to get these horses prepared to be adopted into their forever homes. Cloud is an adorable 15 year old Half-Arabian Registered gelding. He is completely blind in his right eye and mostly blind in his left eye. We believe his blindness in his left eye is recent, as he is still adjusting to life with very little vision. He is not broke to ride, nor will we be breaking him. Due to his blindness, Cloud is insecure, fearful, and non trusting of humans. We are working to build his confidence and trust. Cloud is a gorgeous horse with beautiful markings. He has a sweet nature to him and is not very reactive. He wants to trust so much and when he is turned out with his buddy (Solly) you would never know he is blind. ​Cloud is in rehabilitation and will only be available for adoption once he is completely adjusted to being blind and can safely be handled and have hooves trimmed. 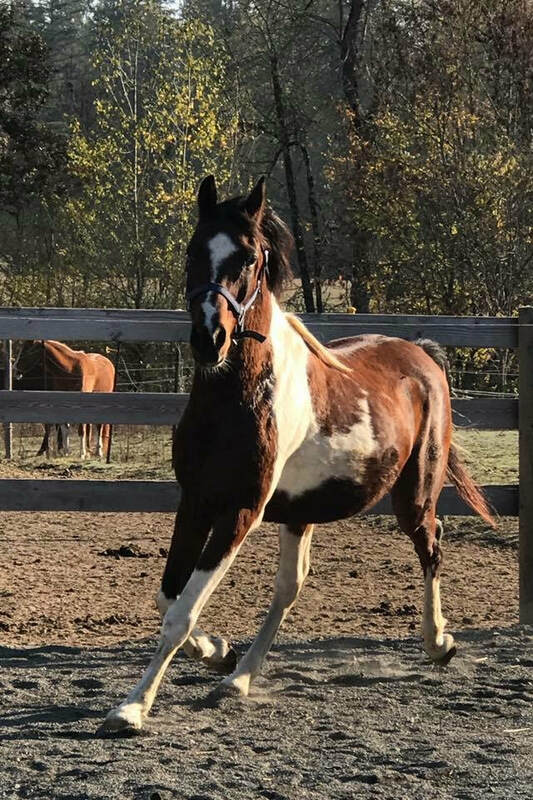 He is a companion horse only and will absolutely need a companion horse that can be his eyes. He has bonded well with Solly, one of our other rescue horses. Dreamy is a lovely 11 year old 14.2 hh mare with a floaty trot. Sadly, Dreamy has passed through many hands, each time, becoming less trusting of humans. As a way to survive, she became extremely reactive and difficult to handle. Dreamy is blind in her right eye, but sees well with her left eye. Dreamy is insecure, fearful, non trusting of humans, and is extremely reactive. She can be very anxious and reactive, similar to a panic attack for a human. Dreamy needs an experienced handler as she can quickly become reactive for very little reason. As long as there are no stressors, Dreamy is fine. Even sweet and will approach people for treats and scratches. Dreamy is currently in rehabilitation with a trainer who specializes in liberty work. We are hopeful that she will learn to connect and through that connection learn to trust. Dreamy is young at only 11 years old. She is built lovely and has gorgeous movement. It’s like she floats on air—so “dreamy”. You can sense how sweet and engaging she is and wants very much to have a relationship with a human. ​Once ready, Dreamy will be available for adoption as a companion horse. She will have the potential to be a riding horse, but the connection, trust, and mutual respect between Dreamy and adopter has to be well established before Dreamy is put under saddle.